Prestage Foods of St. Pauls, N.C., is recalling approximately 38,475 pounds of fresh ground turkey. The products may be contaminated with extraneous materials, specifically metal shavings. 1.3-lb. White Styrofoam trays with clear plastic film covering packages containing ground turkey labeled “Publix ground turkey breast WITH NATURAL FLAVORINGS” with ink jet printing on the side of trays displaying the first 4 digits of 7268 and 7269. 1.3-lb. White Styrofoam trays with clear plastic film covering packages containing ground turkey labeled “Publix ground turkey WITH NATURAL FLAVORINGS” with ink jet labeling on the side of trays displaying the first 4 digits of 7268 and 7269. 1.2-lb. White Styrofoam trays with clear plastic film covering packages containing ground turkey labeled “Fit & Active Fresh Ground Turkey With Natural Flavoring” with ink jet labeling on the side of trays displaying the first 4 digits of 7268 and 7269. 1.0-lb. 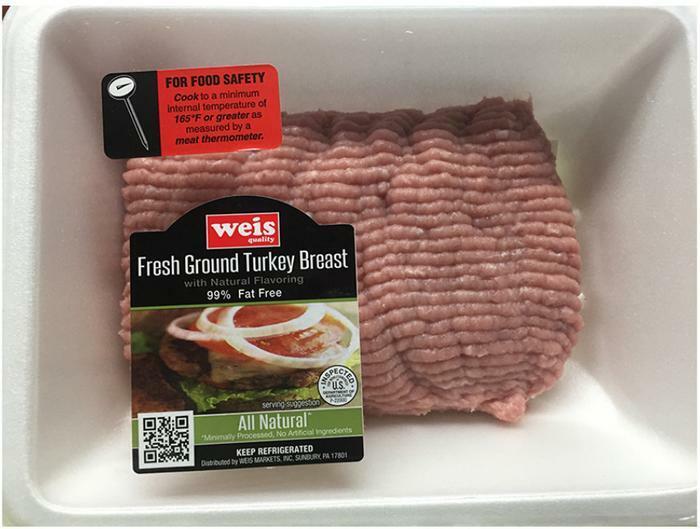 White Styrofoam trays with clear plastic film covering packages containing ground turkey labeled “Weis Markets Fresh Ground Turkey Breast” with ink jet labeling on the side of trays displaying the first 4 digits of 7268 and 7269. The recalled products, bearing establishment number “P-22000” inside the USDA mark of inspection, were shipped to retail distribution centers in Alabama, Connecticut, Florida, Georgia, New York, North Carolina, South Carolina, Pennsylvania and Tennessee. Consumers with questions about the recall may contact Deborah Johnson at (910) 596-5833.